We are pleased to present our yearly report. An important part of the Council for Economic Opportunities’ success is employing women and men who are seasoned, empathetic, hard-working and understand the plight of others. In fact, many of our employees have overcome challenging circumstances through education and perseverance to become the compassionate and diligent professionals they are today. We are young and old and represent our community’s diversity and promise. We are all here to help our neighbors who go to work everyday, but are often struggling to make ends meet. This report features just a few of our dedicated staff members, the work they do to help those in need in our community, and the dream they have for them. 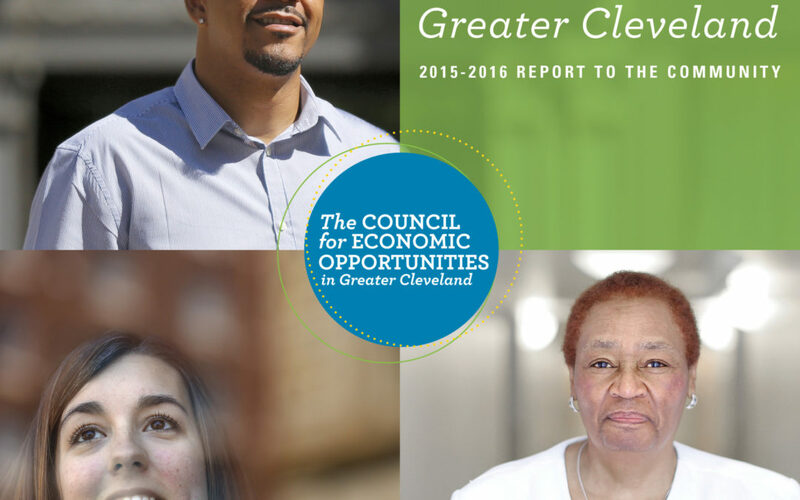 To assist us in increasing awareness in our broader Cleveland community, the Council launched this new website earlier this year that features stories about the residents we serve, our employees that make it happen and important news about the evolution of the Council for Economic Opportunities. It’s vital to notice our neighbors who need help, to reach out and encourage them to dream and to help them take the first step towards a better future. The Council for Economic Opportunities has created spaces where our clients are encouraged to come as they are, where our people are skilled in helping them to see beyond their current situation, and helping them to make measurable progress toward a better life. After 20 years in the Halle Building, the Council is consolidating its downtown offices into one space at 1801 Superior Avenue to best serve our customers. The consolidation will be complete in January 2017. Read the full 2015-16 Report to the Community here.